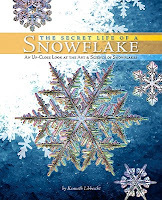 William and I have been reading books about snow -- Snowflake Bentley, The Story of Snow, and The Secret Life of a Snowflake. Sadly, we won't be having white holidays this year. In fact, it looks like it will be raining. Even though we don't expect to see flakes any time soon, we're still dreaming of snow angels, sledding, snowball fights, and hoping for at least one snow day. Have you been dreaming of snow? Whether you love it or hate, we've all got some snow poetry in our hearts. I particularly like to read about it during this time of year. I'm fond of Dickinson (It sifts from leaden sieves,/ It powders all the wood,/ It fills with alabaster wool/ The wrinkles of the road. ), Collins (Today we woke up to a revolution of snow,/ its white flag waving over everything,/ the landscape vanished,), Stevens (One must have a mind of winter/ To regard the frost and the boughs/ Of the pine-trees crusted with snow;) and many others. So, I've been inspired to read and write about snow this week. How about you? Leave me a note about your poem and I'll share the results later this week. If you could write your life or someone else's in an abbreviated form, what would it look like? This is the question I ask myself every time I read Paul Violi's poem "Index." You can read the poem at The Agonist. You may also be interested in Violi's words on the poem. While thinking this might be an interesting form to try, I came across some "table of contents" poems. So, I'm imagining this as something of a biographical (or autobiographical) list poem. Let's see what kind of poetry we can make of this, shall we? Leave me a note about your poem and I'll share the results here later this week. My students have begun to turn in their final projects for math. This semester, a few brave souls are putting all their materials online. As their work goes live, I'll link it here for those of you with an interest. Today I am highlighting the work of Christine Mingus. Check out her project entitled Playing With Patterns. You'll find kindergarten resources for at least 10 different station activities, all complete with downloads.